With data from 35 markets, WIPO and the IPA introduce a joint study to quantify the global publishing industry and identify valuable insights about the book business. The first iteration of a new study of world publishing was released on Thursday (May 29) by the International Publishers Association (IPA) and the World Intellectual Property Association (WIPO). 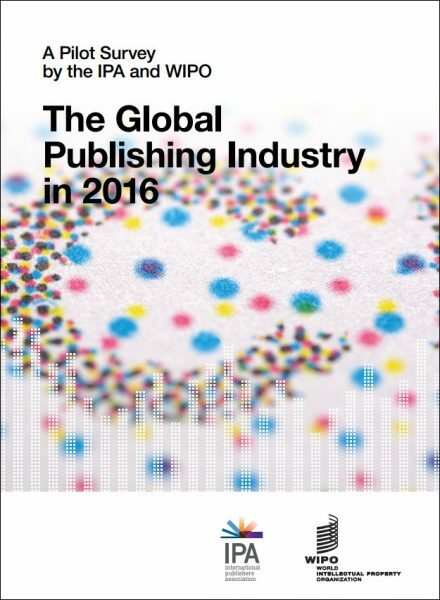 Titled The Global Publishing Industry in 2016, it’s intended to annually gather statistics on the book publishing industry at the global scale, no small feat. The IPA comprises some 70 publishers associations from around 60 countries, so it does have a lot of resources from which to draw. And cooperation between WIPO and the IPA on this is relatively new. In a note of background, we read, “For several years, the IPA has conducted an annual survey among its members, compiling available statistics and presenting them in the IPA annual report. While these statistics have been a valuable reference source, they could not draw a truly global picture of the industry covering all publishing markets. 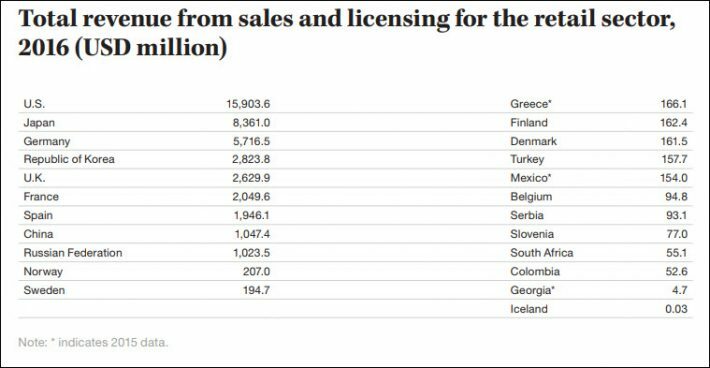 Based on data from 11 countries, total net revenue from sales and licensing for the three sectors amount to US$41.9 billion in 2016. China reported a combined total of 57.8 million published titles in 2016. 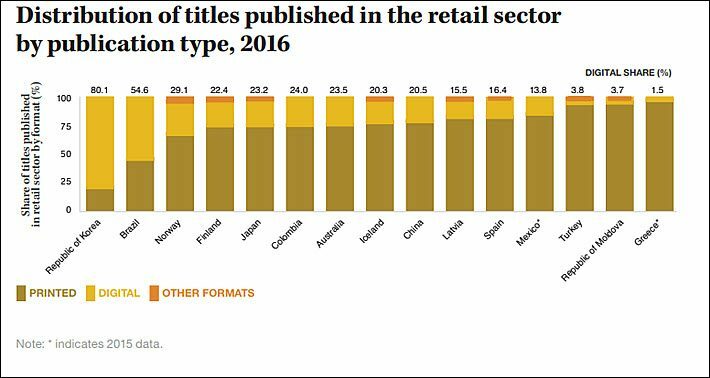 In nine of the 19 countries reporting on numbers of retail titles published, “the retail sector accounted for more than half of all titles published,” the report says, from 87.4 percent in Latvia to 57.8 in Spain. Data for the United States, the report says, wasn’t available. One of the most interesting things seen in this relatively small first sample of responding markets is that in two countries, South Korea and Brazil, more digital titles than print-format titles were reported published. This problem is, indeed, huge. The fact that the world’s largest retailer of books holds as proprietary information digital sales data and numbers on its own products’ sales simply makes it impossible for us to know the actual size, shape, and activity of the industry. On the other hand, some nuance is missing here. The sole use of an “ASIN,” Amazon’s own tracking number, rather than an ISBN, generally applies to digital editions. Amazon Publishing and CreateSpace print editions do, in fact, usually carry ISBNs in addition to ASINs. 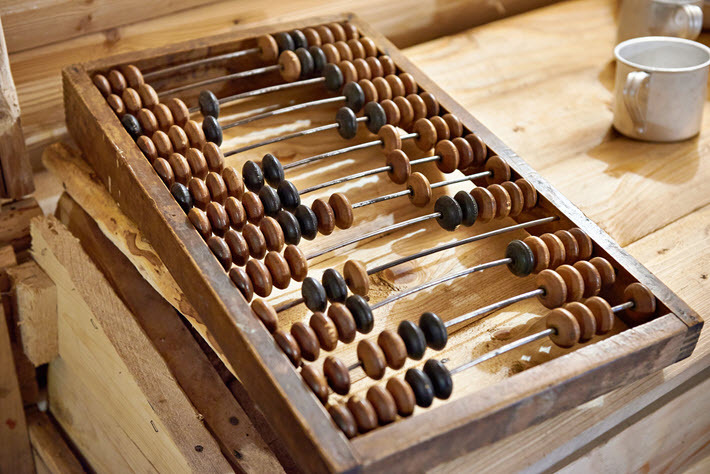 Nevertheless, as anyone in the US or UK markets with their large digital sectors can tell you, the missing sales data withheld by Amazon is ruinous to efforts to definitively describe a market, and, as we see here, the issue is complicated not only by non-reportage but also by uneven approaches in formats. And at this point, the report, while certainly a welcome addition to statistical gathering efforts in world publishing, is hobbled by much missing information, as its presenters readily say. 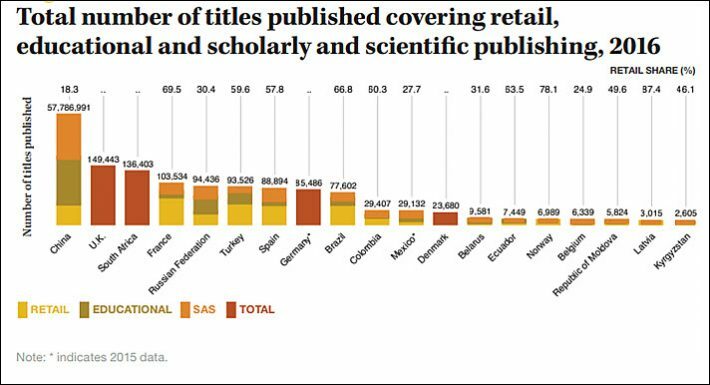 For example, with the compatible data available, it’s possible for the report’s authors to say that China published 57.8 million titles in 2016 and the next nearest country was the UK with 49,433. And how interesting it is that South Africa arrives as the third biggest producer of those reporting, with 136,403 titles in 2016, ahead of France, Russia, Turkey, Spain, and Germany. Clearly, what we have now is tantalizing. It makes us know how badly this worldwide industry needs complete data and reliable reporting protocols. WIPO and the IPA are fine stewards of the process. And as much as we all may wish it had begun long ago, if such an effort can now gradually structure and promote full disclosure and responsible reportage among a growing number of markets each year, then publishing is already on the road to knowing itself much better.